I received an email from one of my Seller client couples. They have decided to renew their dream of retiring to their Wellfleet home, prompted by seven days without power at their New Hampshire home. Good answer! While the northeast has been pummeled for over a week by bad weather, including over a foot in some places, that has taken out power lines and produced some shoreline erosion on the South Shore (between Boston and Plymouth), the Outer Cape has been, relatively, only lightly 'touched'. That said, we received about 6-10 inches of the white stuff Friday evening. The good news is that the warmer weather, and some light rain, today has cleared the roads and begun the melting process. 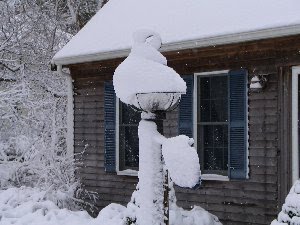 The photo was taken yesterday morning at my home in Eastham. The benchmark 30-year fixed-rate mortgage tumbled to a national average 5.17% this week, the lowest level since Freddie Mac began its weekly rate survey in 1971. Go to MarketWatch.com for the whole story. It won't be long until the full effect is felt on the Outer Cape. 2009 is going to be a good year! Cramer: Bernanke Finally 'Gets It"
Jim Cramer (the love-him or hate-him financial guru) has predicted for quite some time that the housing financial meltdown will formally 'bottom' next summer. He sees yesterday's action by the Fed as a major step in making his prediction come true. With the Fed rate drop of 3/4 of a point, Cramers sees today's low mortgage rates potentially going into the 3's next year. He further says that NOW is the time to buy. Read his article HERE. HGTV's Frontdoor.com published a new article about buying a second home. Nationally, one out of three homes sold in 2007 was a vacation home or investment property, showing that demand for second homes remains healthy despite a slow housing market. With homebuyers enjoying an advantage in many markets (including Eastham and the Outer Cape), now may be the time to buy that second home. It's an important read. Go to Buying a Second Home at Frontdoor.com. The Fair Credit Reporting Act (FCRA) lets you request a free copy of your credit report from each bureau every twelve months at AnnualCreditReport.com. It's been mentioned numerous times before (along with all the scam sites looking to profit off it) but do you regularly check your credit history for errors? It's no wonder consumers find an estimated 13 million inaccuracies on their credit reports each year. New Low Mortgage Rates - Wow! I checked again today - today's 30 year/no points rate is 5.00%. With the current Buyers' market on Cape Cod (and most other places, I believe) these rates make real estate a difficult investment to ignore. These are real rates - not future maybes. At 5.00%, use $5.38 per $1000 to calculate your monthly mortgage expense. Or, go to my website's Buyers Page and use the mortgage calculator. My wife, Beverly, and I were in a high end mall (in New Jersey) this morning, doing some Christmas shopping for my son-in-law. The problem with this mall is that it's REALLY high-end. How did I know? There was a Bentley convertible in the mall with velvet ropes around it. Not your average extravagance. Not mine, either. Mortgages at 4.5% ? - Maybe! Will it be possible to get a mortgage for your Eastham home at rates as low as 4.5% ? Maybe! The Treasury Department is contemplating a proposal that would cut mortgage rates for new loans for homes, according to the Wall Street Journal. The plan would employ Fannie Mae & Fannie Mae to offer mortgages with rates as low as 4.5%, roughly 1 percentage point lower than current rates. The measure is under consideration as part of the Treasury Department's continued effort to limit foreclosures, which has been at the core of the financial crisis. The plan would seek to revitalize the financial market without bailing out homeowners and lenders. Go to MarketWatch.com for the whole story. I want to thank you for all that you did to help us through the process of the purchase, right from the beginning to end. We are especially grateful for all the extra tips & advice along the way. We were impressed that you were always available if we had questions or concerns, even while on vacation in Alaska! I hope you are enjoying the autumn weather & foliage. We look forward to getting to know the Cape better in all four seasons. When doing your Christmas cards this year, take one card and send it to this address. If we pass this on and everyone sends one card, think of how many cards these wonderful special people who have sacrificed so much would get. I looked this morning and the mortgage rates are at 5.25% for 30 yrs/no points. Look at what that means to the ‘affordability’ of an Eastham home. For the same monthly payment (and a slightly increased down payment) you can buy 8% more house at 5.25% than at a 6% mortgage. This example is scalable, so go to my website’s Buyers Page and use your numbers in the mortgage calculator. Please note that the maximum mortgage currently offered at the 5.25% rate is $417K.